You’ve already figured out the ideal configurations based on your needs for your PC build, but are yet to decide on the tempered PC case to purchase. PC chassis isn't just a simple box and enthusiast builders and upgraders alike will agree. They're complicated with many options to choose from, multiple lingoes, features, and more. If you’re a beginner, the terminologies will get your head spinning. To simplify it, you want a tempered glass pc case of the right size to house your hardware and all USB components. As you’ll gather soon, PC cases come in different sizes, types, shapes, and materials and choosing can be a tasking/intimidating endeavor. In the light of this, we spared time to scoured forums, and the internet looking for besttempered glass PC cases there’s. We rounded up a list, prepared a comparison table and then reviewed these cases. It should now be easier to identify a tempered glass PC case that’ll suit your needs at a glance. Keep reading! It’s an immaculate case fan sporting four glass tempered panels that cover the entire chassis. The case packs a punch in specs and features not limited to stunning three SP120 RGB LED fans, excellent cable management, and direct airflow. Constructed using steel and with 4mm tempered glass left side window tightened with thumb screws at each corner, Thermaltake V200 ATV is tough enough to withstand the rigors of everyday use. It'll support ATX, micro ATX, and mini-ITX motherboards. The mid-tower PC case has a full-length PSU cover complete with a vent hole that not only provides a clean look but also keeps the cables concealed. Thermaltake V200 ATV also comes integrated with a handy I/O port. Positioned on the top front panel are 1 USB 3.0, 2 USB 2.0, 1 HD Audio and an RGB lighting button. For high airflow and sufficient air cooling, the can support up to 9 fans; 3x 120mm & 2x140mm for the front, 2x120mm& 2x140mm for the top and 1x120mm for the rear. There’s also sufficient room for 3 radiators, 1x240mm, 1x280mm at the front and 1x120mm at the back for liquid cooling. What’s more, Thermaltake V200 ATV offers tool-free installation of the HDDs. It features 2.5” and 3.5” drivebays that allow you to fit 3x3.5-inch HDD with HDD bracket plus 2x3.5” HDD with HDD tray. If you value aesthetics, you’ll appreciate its lighting with 16 lighting modes plus 7 colors. With just the touch of a button, tune to Mode 1 for RGB Lighting. Modes 2-8 give you a Single Color, modes 9-15 give you Breath Mode while mode 16 turns off the lighting. You can also control the lighting via 12V header RGB sync motherboard. Sporting an elegant minimalist design, CORSAIR Obsidian 500D features superior aluminum constructions and smoked tempered glass on the side. And for easy access, it comes with a hinged door. CORSAIR Obsidian 500D isn't just a beautiful face. This mid-tower case employs Direct Airflow Path technology with plenty of space for sufficient cooling. Its unobstructed front allows proper airflow effectively cooling the hardware. If you love liquid/water cooling, the PC case has enough room to fit a 360mm radiator on the front and an additional 240mm or 280mm radiator at the top. What’s more, you can easily expand your build for storage. It comes with 2x3.5” drivebays for mechanical storage plus 3x2.5” drivebays for SDD storage. CORSAIR Obsidian 500D features a PSU cover plus a rear cable cover that make it possible to conceal the cables behind the motherboard tray. That allows for clean cable routing. While at it, it leaves enough space for other important accessories including the CASAIR Commander Pro, RGB LED strips as well as Lighting Node Pro. As if that’s not enough, the PC chassis has sleek front panels with multiple connectivity options including 2xUSB 3.1, USB 3.1 Type C, mic and speaker interfaces. Even better, it comes with removable dust filters. Clean them from time to time to keep your system at peak performance. ROSEWILL Prism S500 ATX sports a simple yet sleek design with sharp edges complete with robust top and front panels. Featuring dual LED ring RGB case fans, there's no better way to show off your build. The built-in LED side strips allow you to enjoy more RGB lighting and adds a more flare to the build. Use the 5V RGB fun hub to enable Aura Sync or even Mystic Light so you can control the fan LED and effects. It has a clear tempered glass to the front with mounting points that highlight the RGB lighting granting the case the much-needed esthetic appeal for a battlestation. ROSEWILL Prism S500 ATX boasts clean cable management. The top mount PSU shroud makes it simple to tuck away the PSU, hard disk and SSD cables for proper air circulation. This mid-tower case is designed to fit micro ATX & ATX motherboards. It comes integrated with external 5.25in drivebays and internal 3.5”, 2.5” internal drivebays for storage. ROSEWILL Prism S500 ATX also grants you access to a variety of connectivity options with 2 USB 3.0, Audio In/Out and LED light control positioned on the front panel. What’s more, this PC case supports air cooling and liquid cooling. Pre-installed at the bottom are 3x120mm fans, 1x120mm rear pre-installed fan and 2x120mm side optional fans. It also leaves room for the bottom up to 360mm radiator or a side up to 240mm radiator. Removable dust filters allow for easy cleaning. ROSEWILL Prism S500 ATX measures 18.70" x 8.27" x 18.50" and will support up to 440mm (L) GPU, maximum 160mm in CPU cooler height. It’s been crafted with dual 4mm thick tempered glass covering the front and back and reinforced with mounts and TG Safe Brackets that hold each panel allowing for hassle-free removal and installation. Thermaltake View 21 ATX Mid-Tower Case is robust. It supports mini-ITX, micro ATX, and ATX motherboards. Enjoy maximum expandability and liquid cooling with the 4 concealed 3.5” and 2.5”HDD drivebays. It’ll support CPU with 160mm maximum height and dual VGA up to 410mm in length. Fully modular drive brackets allow for easy installation/removal and optimize the interior space for more customized cooling. A pre-mounted PSU shroud allows for advanced cable management and sufficient cooling. Fitted at the front is a magnetic fan filter while the bottom has super fine fan filters. Both offer outstanding protection and significantly reduce dust and dirt to reduce overheating. Thermaltake View 21 ATX Mid-Tower Case features superior cooling capabilities. It’s been optimized for excellent ventilation and supports liquid cooling solutions. The mesh panel design makes it possible for it to support 3x120mm fans or 2x140mm fans plus 120mm exhaust fan for excellent airflow. It also comes with handy I/O ports including 2xUSB 3.0, HD audio connector plus a Power and Reset Button positioned at the top front panel. These offer direct and quick access. Phanteks Enthoo Evolv ATX features\ a 3mm thick sandblasted aluminum body complete with tempered glass side panels. And for easy installation/removal, it comes with retractable radiator brackets. The quick release panels allow for quick access. To ensure optimum airflow to the system’s components, Phanteks Enthoo Evolv ATX comes fitted with 3 Phanteks premium fans, 2x140mm front fans, and 1x120mm rear fan. Also included is a Phanteks PWM hub. Phanteks Enthoo Evolv ATX prides itself in its excellent cable management thanks to the incorporated Hoop-N-Loop cable ties. You have access up to 35mm cable management space. Aside from the fans, the fan boasts long GPU clearance (up to 420mm in length). Get your system illuminated with the RGB LED lights that deliver 10 colors with cool illumination effects. The PC case also comes with 2x Drop-N-Lock SSD brackets plus 3x Modular HDD brackets. Offset radiator brackets prevent the conflict between the memory and radiator. It allows for efficient water cooling. Phanteks Enthoo Evolv ATX comes with a removable dust filter that prevent dust and dirt for easy cleaning. We introduce you a sleek and elegantly beautiful PC case, CORSAIR Crystal 570X. It steps away from the usual to sport four glass tempered panels covering the entire chassis such that you can view every component of your build. Integrated into the case are three SP120 RGB fans that brilliantly light up your build with immaculate LED effects. It also includes an LED controller that you can use to tune to dozens of the preset colors and effects. For more illumination possibilities, easily sync the RGB fans with the included case lighting. This is a feature unique to Crystal 570X RGB Mirror Black. Crystal 570X RGB Mirror Black provides enough room that allows you to build the most ambitious system. It can support up to 6 fans and house 280mm, 360mm, and 120mm radiators. Also positioned at the front and the back are removable fan trays that allow for the easy installation. Conveniently fit and display the graphics cards with the vertical GPU mount. To keep all the system components refreshed and functioning optimally, Crystal 570X RGB Mirror Black employs direct airflow. It also brings to the table clean cable management thanks to the cable routing as the well as the velcro cable straps. Build with a full metal body, a steel exterior, and a glass tempered side panel, we present you Phanteks Eclipse P400 Steel ATX Mid-Tower PC case. The unit boasts clean cable management with its Phanteks’ Velcro cable ties, 25mm cable management space plus an extra cable compartment positioned at the bottom. Phanteks Eclipse P400 uses direct airflow to the components allowing for optimal airflow for efficiently cooling the system. It has 2 Phanteks fans (1x120mm & 1x140mm) and can support water cooling radiators up to 360mm. Also featuring in this case tower is RGB power light complete with an inbuilt RGB lighting controller. Easily tune among the 10 different colors for your preferred effects. It includes an adorable RGB LED strip. Phanteks Eclipse P400 packs a handy concealed front I/O with 2x USB 3.0, headphone, mic, LED controller and Reset conveniently positioned. For a dustless free unit, the PC case comes equipped with magnetic dust filters. It also offers full-size PSU support and the HDD cage is removable to make it easy to install the larger up to 180mm PSUs. It has dual drop-n-lock SDD brackets that allow for tool-less installation of your storages. Crystal 460X is beautifully engineered and sports a dual-panel tempered glass that excellently displays every component in the system. It’s full steel front and top panels render the case not only durable but also beautiful. The PC chassis employs Direct Airflow technology that ensures no drive cages get in the way. It supports liquid cooling for both the CPU and GPU loops. Crystal 460X packs three SP120 GB LED fans. Then fans light up with brilliant effects and help draw in cool air towards the system’s components with zero turbulence. It’s compact and measures 17.32 x 8.66 x 18.27in, but will house a full ATX motherboard and more components. There’s also space for top, front and rear radiators for liquid cooling of your CPU and GPU. Crystal 460X guarantees excellent cable management with its PSU covers and 3.5” drivebay covers. Easily tuck in the cables and the drives behind these two modular covers. The drive provides a tool-free drive installation and offers three-point dust-filter access making it simple to build and maintain clean. 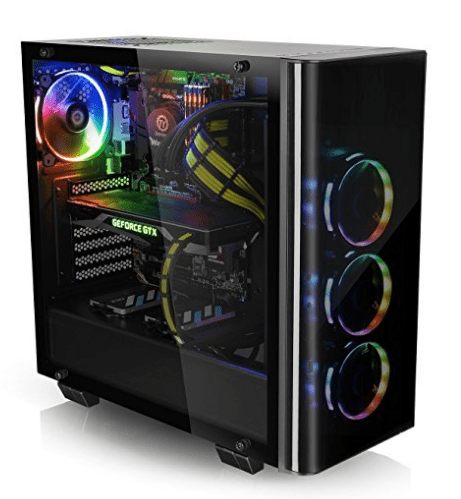 InWin 301 PC case has been engineered using robust 1.22mm thick SECC steel plus 3mm tinted tempered glass panel that displays the inside components. Even better, it packs a tool-less design and requires pressing a button on the handle to remove the tempered glass. The steel side panels are reinforced with friendly affixed thumbscrews. This case has been designed to support both the micro ATX and Mini-ITX motherboards. It also features detachable design cable management that makes it possible to position the cables for proper airflow. Fitted at the bottom is a removable dust filter that prevents dust and dirt and allows for easy cleaning. Also integrated are 2x2.5” SSD brackets plus 2x3.5 HDD drivebays that allow you to fit up to 4 storage drives. InWin 301 present versatile cooling options. It can support up to 240mm radiator at the front and a maximum 120mm rear radiator. The case will also house 1x120mm rear fan, 3x120mm top fan plus 3x120mm bottom fan. What’s more, the case features an immaculate I/O panel with luminescent LED that stunning lighting effects, especially in the dark. Cougar CONQUER ATX packs a stylish design with CNC milled aluminum alloy frame and robust dual 5mm thick tempered glass side panels. It's a Mid-Tower case compatible with ATX, micro ATX, and micro ITX motherboards. The case sports excellent expandability and will house full-sized up to 350mm graphics cards for excellent visuals. Integrated into the PC case are 3x3.5” drivebays + 3x2.5” drivebays that support up to 6 storages. Whether you’re looking to build, upgrade or overclock your system, Cougar CONQUER ATX won’t let down. It’ll support two radiators, up to 360mm at the top and 240mm on the bottom for excellent liquid cooling. Pre-installed are two are 3x 120mm Cougar CFD LED fans that offer excellent airflow while spinning quietly. Cougar CONQUER ATX also features an excellent I/O front panel with 2xUSB 3.0, a mic and audio interface. Before all else, decide on the PC case form factor (size) want for your build. Form factor, in this context, refers to the size of the motherboard a particular case can host. Full Tower, SFF/mid-tower and mini-ITX are the three major sizes of PC cases. Full tower cases are massive with some measuring over 20 inches and will accommodate the most optimistic setups with multiple fans, water cooling and 3 or 4-way graphics configurations. With a full tower case, you can host any ATX motherboard. SFF/mid-tower cases strike up a mid-ground in regards to performance, expansion as well as size. Most mini-ATX motherboards will fit in these cases. Build for diminutive mini-ITX motherboards, mini-ITX cases are small in size and offer limited motherboard choices. Some of these PC chassis are compact enough to fit in home theater cabinets. Considering they can be space-constrained, it isn’t unusual to experience hardware compatibility issues. Although you’ll find a few dirt cheap PC cases, 50 bucks or even less, other than the two fans (rare and front), some of these will only have a few extra basic features. Such a case has no room for certain components like extra-large graphics cards. The rule of thumb, when picking a PC chassis, is to pay extra attention to the size and the additional features. Usually, the features will have a significant influence on the price. Even with a budget below$100, you’ll excellent PC cases that combine water cooling compatibility, tool-less design. Some have incorporated aesthetic niceties such as RGB lighting as well as tempered glass side panels. Bump up your budget to over $150 and you're looking at PC chassis that excel in almost every aspect. These bring to the table plenty of awesome features and multiple connectivity options. In regards to the construction, steel, aluminum, tempered glass, and a combination will come into play. It goes without saying that the specs, features, materials, and properties of a PC case will determine the price, performance, and hardware compatibility. But you’ll have to cough out more notes for tool-free cases with premium features that offer impressive connectivity and room for expansion. Tool-Less Design: To make hard drive mounting simple, mid-range and high-end cases use twist-on snap on a tool-less mechanism. Drivebays and SSD Mounting Joints: Check that your case has sufficient 2.5-Inch & 3.5-Inch drivebays for the storage drives. A 5.25-Inch drivebay is important for mounting an optical drive. Cable Management: Not only does it make a computer look better but also allows for proper airflow and cooling. The case ought to be large enough for the space behind the motherboard to route cables. Front Panel Connectivity: Before settling on any particular case, confirm the front panels ports the unit has. Settle for nothing less than 2 USB front ports (USB Type C in new cases). Keep an eye on the SATA and eSATA ports, HDMI, DisplayPort, memory card slots, microphone, and headphone jacks. Cooling Options: Air-cooling or water/liquid cooling? And is it possible to fit in aftermarket fans other than the built-in fans? Sound Dampening: Want your rig running quietly? Although they impede airflow, some cases include sound dampening materials to reduce the noise annoyance. Dust Filters: Keep the debris from the fans so your system doesn’t run hot and throttle the performance. Tempered Glass Panels: These are common in the newer models of PC cases and an alternative for acrylic windows. Although brittle if mishandled, tempered glass cases are esthetically appealing. Based on your build, there are many more features and specifications to look consider including the power supply unit (PSU), mount location, expansion slots, sufficient graphics cards and CPU clearance, integrated lighting, etc. In choosing tempered glass PC cases, it can be hard to decide. While most of the reviewed PC cases have one or dual tempered glass panels, it’s still possible to land a case with four tempered glass panels covering the entire chassis. Overall, the form factor (size), specs/features and price will tell help a great deal in your decision. We hope you’ve identified an excellent glass tempered PC case for your system.